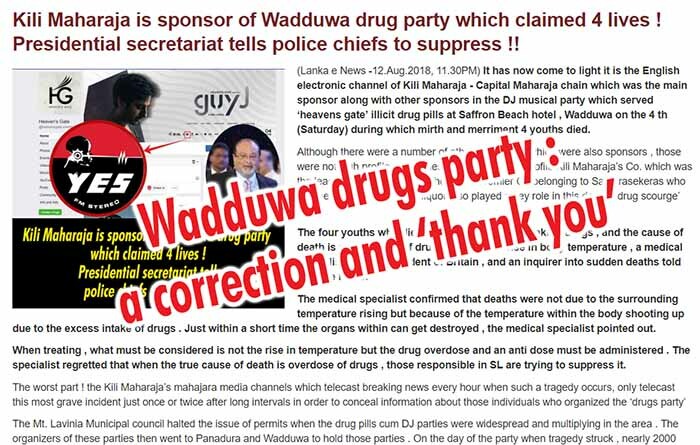 (Lanka e News 14.Aug.2018, 11.45PM) With reference to our report on the 12 th under the caption ‘Kili Maharaja is sponsor of Wadduwa drug party which claimed 4 lives ! Presidential secretariat tells police chiefs to suppress ! !’ , it has become necessary for us to make a correction pertaining to our revelation “the Avant Premier Co. belonging to Samarasekeras who are the agents for Red bull drink also played a key role in this deadly ‘drug scourge’ party” in our article. The SL agents for Red Bull is Stassens Co. Read (https://www.stassengroup.com/fmcg-imports/red-bull/), and Avant Premier Co. is only official event organizer in Red Bull SL . Read (http://www.avpr.lk/redbull/). Red Bull had provided sponsorship to the Wadduwa drug scourge party but Avant premier Co. had not been involved in that. Therefore we tender our apologies to Avant Premier Co. and its directors if our report had offended them in any way, while thanking them for pointing out the lapse. At any rate, our article was mainly focused not on the company aforementioned referred to in just one sentence , rather on the main culprit Kili Maharaja and his capital Maharaja Co. because an establishment provides sponsorship to an event only after knowing the ins and outs as well as about the organizers. In SL such sponsorships are provided based on close personal relationships and to render assistance to the sponsored. Capital Maharaja had been continually and enthusiastically providing sponsorship to these drug parties even after being aware that the tickets are sold at exorbitant prices . Hence if the Maahraja Co. is to say , it sponsored these drug scourge parties without knowing the details and that drugs were being sold at those parties it is an absolute lie. Since our accusations made on the 12 th are most grave that Avant Premier Co. took steps to correct even a mere reference made to them in just one sentence in our report , because they are aware how serious that revelation is. But Kili Maharaja or Capital Maharaja on the other hand despite being the main target of accusation has not made any response so far. This is clear testimony that they know the accusations are absolutely true , and therefore it is better that they remain silent without getting their drug involvements exposed further. In our last article we earnestly urged that , not only the organizers but even the sponsors of the drugs party should be arrested and interrogated because four valuable lives of youths were destroyed. It is noteworthy not only those who committed the crime even those who aided and abetted are criminals. Whether the aiding was done with the knowledge or without can of course be resolved by the court . In the circumstances , our earnest plea today is : not only the organizers of this deadly drug scourge party but even the sponsors should be arrested forthwith.